Levanzo is a small island situated off Trapani to the west of Sicily, and is one of the three main Aegadian islands (with Favignana and Marettimmo). Covering just six square kilometers, Levanzo is a popular destination for both its cultural and natural highlights. It has lovely scenery and coastline and is known for the exceptional prehistoric cave paintings which are among the very best in Italy. Although Levanzo is a very small island with limited tourist facilities you will find that it is very pleasant to explore. The Port of Levanzo has quaint small whitewashed houses around the harbour and with the hill rising steeply behind and small boats bobbing on the water it is very picturesque. One of the first things you will notice is the extraordinary colour of the sea which has a pure rock seabed and is wonderfully clear. Swimming and snorkling to admire the abundant sealife are popular activites around the coast and especially around the 'Faraglione' on the west of the island where the marine life is particularly abundant. Diving and fishing trips can be organised on the island. To see more of the coast you can take a boat trip off the coast of Levanzo. There is also an attractive coast path that you can walk. Head west from Levanzo and the path takes you to the large 'Faraglione' rock in the sea. Head west and the path takes you to Cala Minnola, a popular cove great for swimming and sunbathing. There are a couple of pleasant picnic spots along the way. There is also a path that leads up the hill of Pizzo del Monaco which is the highest point on the island. The most important highlight on Levanzo though is its prehistoric caves and their engravings, including the cave referred to to as 'the button-hole of Levanzo', now better known as the Grotta del Genovese and discovered in 1949. In the innermost parts of the cave there is some 'graffiti' that dates back almost 10,000 years, depicting animals and three men. The animals pictured are a deer, an ox-bull, and a small monkey. The three figures of the men are gathered to form a small scene, perhaps a dance. 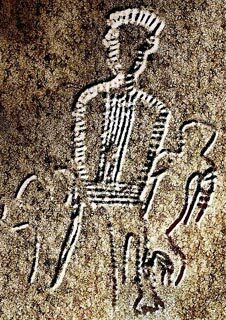 Further pictures to the side are much smaller and often have the appearance of sketches. The Grotta Genovese is not the only prehistoric cave in Levanzo, and the “Grotta dei Porci” (Cave of Pigs), close to the Genovese caves, is also very important. Professor Graziosi discovered this cave in 1952, in an inland area. This cave also shows figures of animals, although painted with a less refined technique. The cave is about 30 meters deep. In Levanzo there are about a further dozen prehistoric caves, among which are the “Punta Cappero”, “Cala Tramontana”, “Pecore” and “Punta Sorci” caves. Food is important on an island where relaxation is key to your enjoyment and the typical dishes of the island include: fish couscous, with scorpion fish and onion; lobster soup, slightly spicy with almonds, and “lasagne alla marinara”, a real specialty with seafood, white sauce and aubergine. If you really want peace and quiet then visit the neighbouring island of Marettimmo. It is a longer boat trip than Levanzo and Favignana and therefore remains much quieter. Especially if you visit in June and September. 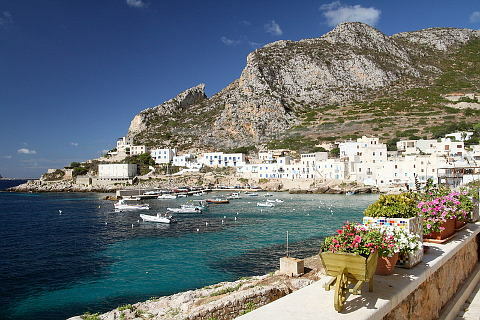 Favignana is popular with walkers and hikers and its harbour town is a pretty town spreading around the bay. See also Levanzo history and etymology.